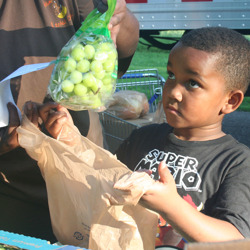 In Mid-South Food Bank's service area, 23.3 percent of children are food insecure, according to the latest Map the Meal Gap hunger study. That's nearly one in every 5 children. Even short-term nutritional deficiency can impact a child's health and ability to learn. 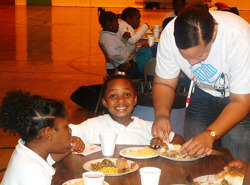 Mid-South Food Bank serves children in our region by distributing food through its partner agencies, and through our child hunger programs, Kids Cafe, Food for Kids BackPacks and Healthy School Pantry: Kids Cafe provides nutritious meals to kids daily in a safe environment, where they are served by volunteers and have an opportunity to learn the importance of nutritious eating through delicious meals and instruction. 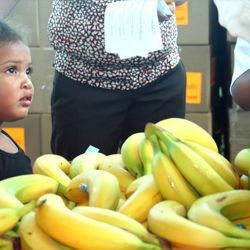 The Food for Kids BackPack Program provides a BackPack box filled with nutritious, child-friendly food for children to take home for the weekend. 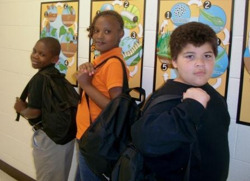 Each backpack contains six complete meals and some fun, nutrition information. Healthy School Pantries are set up at school, providing monthly supplemental food boxes for qualified students and their families.